My first full season as a ‘part time’ bass fishing guide was hugely satisfying on a number of levels – not least, because of the bass my clients landed, the learning that took place (on both sides), the experiences enjoyed plus the memories and friends made. All of which made the decision to become ‘full time’ and dare I say it a ‘professional’ guide in 2018 an easier one to make. With many of my former clients (and those I’m yet to meet) taking advantage of my ‘New Year’s Voucher Offer’ in addition to the ‘Taster Package Deals’ in June (more will follow in September, October and November if they’re successful) I am obviously ‘champing at the bit’ to get going. I’m always busy behind the scenes and have been working on a number of projects since the New Year, one of which I am extremely excited about. Moreover, I have been utilising my spare time to investigate a number of new bass marks – primarily with lure fishing for bass in darkness in mind. A word on safety first of all. Having grown up with the sea, I have witnessed on a number of occasions, the unpredictable nature and power it possesses – indeed, this is one of the main reasons I never fish when I’m guiding clients. 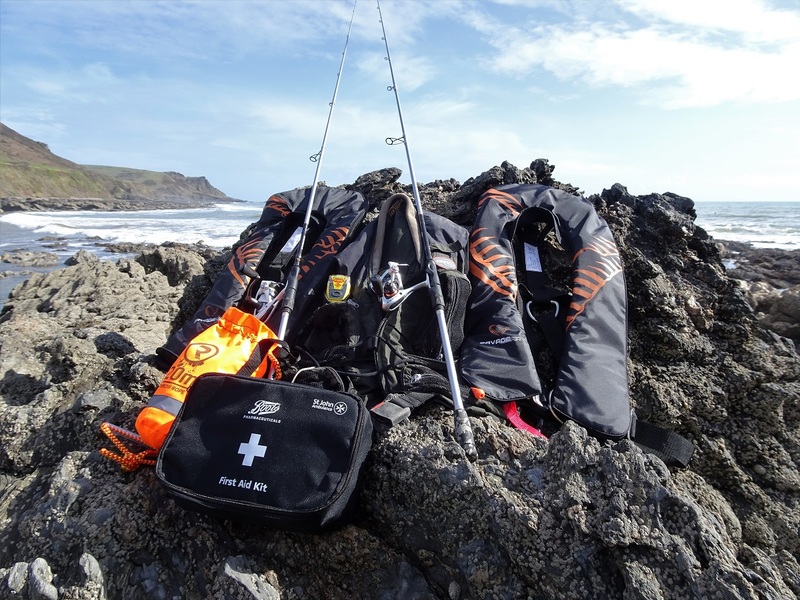 If I’m fishing alone, I wear a self inflating life jacket here but increasingly, and certainly towards the end of last season, I found myself guiding two clients, and will (in June) be guiding three at once therefore, it seemed both prudent and sensible to attain some automatic life jackets for my clients. My sincere thanks to Savage Gear for supplying these. If one of my clients were to have an incident – I hope that by wearing one of these Life Jackets here it would offer them some crucial time for me to get the Throw Rope out. The video below (that was produced by Henry Gilbey in association with the RNLI) unequivocally ‘rams home’ the trouble anyone could find themselves in, should they either fall, or are washed into the sea without wearing a life jacket. I have always carried a rope and a First Aid Kit with me (when guiding) but have decided to enhance these two items by way of a 20m buoyant ‘Throw Rope’ here and the St John’s Ambulance kit here. Furthermore, the lack of a mobile phone signal, in conjunction with the very remote places I am often located (increasingly so in the dead of night) prompted me to purchase a Personal Locator Beacon (PLB) here. Once activated, this device transmits on the 406 MHz distress frequency, which is monitored by the Cospas-Sarsat satellite system – the alert is then relayed to the nearest Rescue Coordination Centre (RCC). The PLB also uses an internal Global Positioning System (GPS) receiver to pinpoint a location to within 62m to which, once in the vicinity, the Search And Rescue (SAR) services are then able to ‘home in’ on your precise location using the inbuilt 121.5Mhz transmitter. Hopefully, I’ll never have to use it, but you just never know when you’re dealing with the sea, cliffs, rocks and occurrences and factors out of your control. Activating the Personal Locator Beacon (PLB) means that I wouldn’t need to leave a client on their own (to search for a mobile phone signal) in the worst case scenario. My Wife is happier too, as she does worry about me fishing alone – especially at night. Following the success of the white or pearl Albie Snax at night, I am very keen (in the course of my personal fishing initially) to utilise the Amber Gold and Smoke Silver Fleck patterns in and around some inviting features amongst the reef systems during daylight. Further, two regulars in my collection have been replenished accordingly – the OSP DoLive Stick and the Fish Arrow Flash. Will these beauties, with their ‘slaloming action’ do the business by day? A great little Blennie or Rocking imitation. The Fish Arrow Flash J 5″ rigged and tethered onto a belly weighted weedless hook – a combination that looks phenomenal in the water. The OSP DoLive Stick is undoubtedly a brilliant lure. But there must be reason why I’ve never caught a bass over 3lb on one – could a change to a lighter leader be the answer? Please do get in contact of you’re interested in booking a guided bass fishing session along the stunning south Devon coastline. My What I Offer page explains what I aim to teach you, my qualifications and the extras included in the service I provide. From the initial contact – which I am happy to receive via text, phone call, Facebook Messenger or e-mail (either direct or via the Contact Me page) all I require is a ‘rough date’ or period (a week) that you have in mind. From there I can interrogate the tide times and heights, the moon phases, Sun/Moon rising/setting times and the twilight times in order to provide you with a day(s) or night(s) when I believe the most opportune periods could occur. Alternatively, if there is a specific day, or even time of day that suits you, I will do my utmost to facilitate your requirements. Once we have agreed a date(s) I will e-mail you the respective forms (below) and ask for a minimum deposit of £50 (payable directly to my bank account) to confirm the booking. The final balance can be paid either in cash (on the day) whereby I’ll issue a receipt for HMRC purposes, or you can transfer the remaining balance to me prior to the session taking place. What constitutes as a good bass mark. What lures to utilise over certain types of ground. What lures to utilise in certain sea conditions. How to effectively ‘work’ the lure in the most expeditious manner. Watercraft – the art of capitalising on the naturally occurring elements to increase your chances of catching. My ‘Health & Safety’ brief is designed to reassure you that all risks have been identified in relation to shore fishing activities (a Risk Assessment is available if you require it). Furthermore, all necessary mitigation and/or precautions have been implemented for your safety to reduce the probability of injuries. Admittedly, most of the items contained within it are common sense, but even though it is part and parcel of what I do, I appreciate that some people aren’t so confident, or may have spent very little time walking on rocks. Finally, the completion of my ‘Insurance Disclaimer’ validates my Public Liability Insurance and assists me make decisions in regards to mark selection and more particularly, in relation to the proposed distance to be walked, the type of terrain and how water confident you may be. London, the South East, Somerset, Hampshire and Oxfordshire are all seemingly a hot-bed of bass fishing enthusiasts! And with more and more clients travelling down to south Devon from all over the Country and staying the night (either before, during or after the guided sessions) it necessitated a requirement for me to thoroughly investigate some suitable accommodation. My local, and very highly regarded Bed and Breakfast Chillington House serves two purposes. Firstly, it offers excellent value for money to the travelling angler, and secondly, it means I can drive you to and from the fishing marks – something that if you’ve never experienced the Devon lanes is hugely beneficial! If you do require accommodation then please do not hesitate to ask and I will arrange this for you. Furthermore, if you would like me to facilitate a bespoke package, catered to you, or a group (up to three anglers), including accommodation then please get in touch and I will price it up for you. There has been a marked increase in the amount of general bait anglers eager to sample some lure fishing for bass and indeed, complete novices therefore, once you’ve confirmed a booking with me, I am also more than happy to offer advice in relation to the equipment you may require – be it rods, reels, lures or associated items. Moreover, sporting anglers from the Trout, Fly and Salmon fishing fraternities now make up a high percentage of my bookings – something that is very pleasing indeed. My terms and conditions (here) have always stipulated that I operate to purely a ‘catch and release’ policy. But it is now law that ‘all bass caught by recreational sea anglers during 2018 must be returned’ – the official guidance from the Government via the Maritime Management Organisation (MMO) can be found here. Categorically, there is not a ban on targeting and catching bass (I have received the odd item of confused correspondence) – but they do have to be returned. Consequently, for my fellow bass/lure anglers and I nothing has changed, as the overwhelming majority of us would have returned them anyway. Finally, I am, like thousands of others I suspect, counting down the days (in fact hours) until I can head out onto the coastline with a very realistic chance of a decent bass. 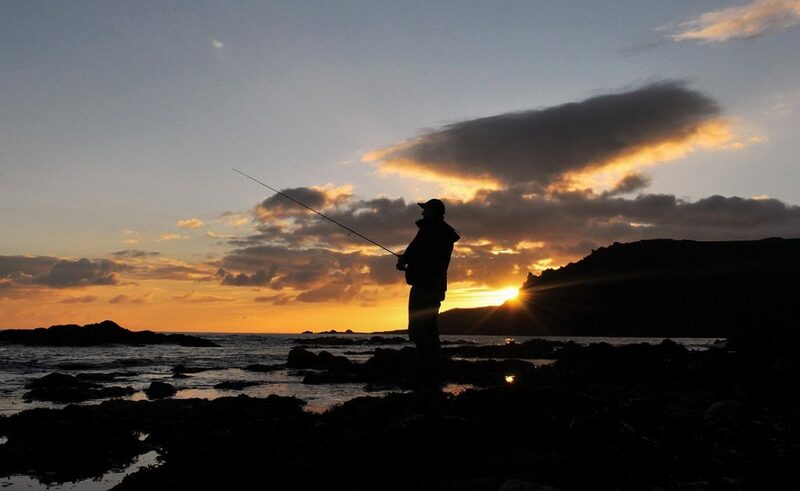 That anglers in Guernsey were catching them in February, on surface lures, in the snow, when the water temperature was around 7ºC is quite remarkable – I have huge respect to those anglers, well done indeed. Now please send some over the Channel to all of us patiently waiting! My next couple of posts will focus on ‘10 inexpensive hard lures that work‘ and a run down of ‘New lures I’ll be testing out this season‘.